Out now! Order your alien heads here (or by E-mail). 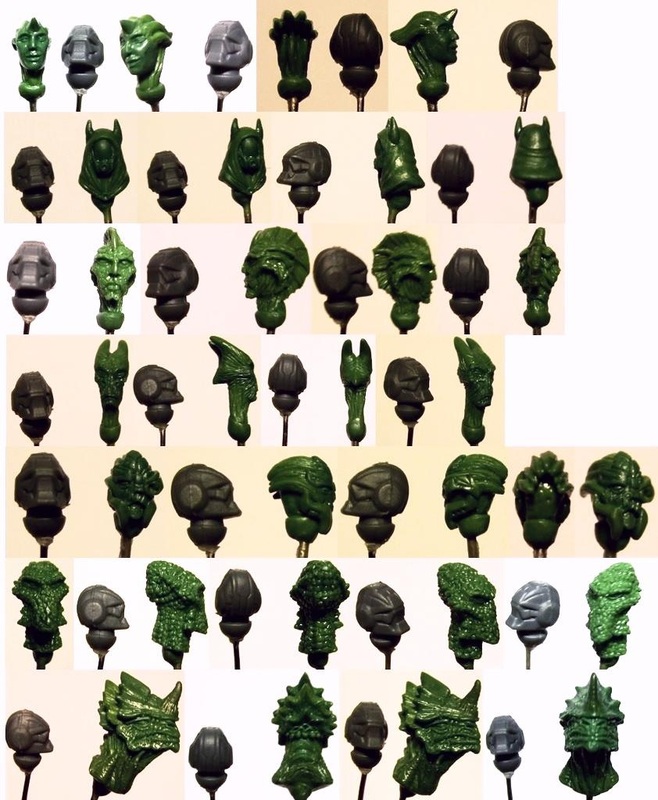 Each kit contain 7 unique alien heads, priced at €7,5 upon release. The style is parodical. Made to fit 28mm miniatures. Part of the fun will be to find suitable bodies for the two larger heads. Cast in whitemetal by Custom Made Miniatures. Pictures of painted heads included for display purposes only. The infamous stock-market shark was alerted by the approach of the bounty hunter within his cavernous office room, first by various sensor alerts, then by his own ears, which had been artificially grown in vats after that filthy whore bit them off with two nasty bites. He tapped a tiny touchplate on his armrest, and slowly his large padded chair swivelled around to greet the newcomer. It wasn't a pretty sight which lay back in the chair. Extensive synthetic skinplants and cosmetic operations had been carried out to make an old human appear as a young virile stud of man. It had looked genuine the first decade, but since then decay had caught up, and no amount of continuous treatment could any longer mask the faked impression of the skinplants and artificial hair mane. This pretension at style was exquisitely draped. Expensively clothed, but not clothed with style. The entire appearance of the mogul radiated a garish lack of taste. The old money laughed behind his back, and his lack of sophistication and culture made him the open ridicule of high society. Yet the Shark lacked the insight to catch any of this, and did not even understand that he was the one being scoffed and mocked in a thousand and one subtle ways. The loud-mouthed center of cocktail parties and skyglide cruises alike, he was more at home in his office making money with grubby sods than in the feasting places of the ruling elite. And he was more at home in brothels, vapour nests and drinking dens than anywhere else. This time, he received guests clothed, at least, so no one should complain. That wealthy wretch of a man drew a long pull off his smogstick, and took great pleasure in activating the facial microcanals that allowed the lilac smoke to be puffed out of his ears.”Well?” he bayed with an arrogant tone which he himself had never been aware of, but which all in his surroundings were at pains to endure. The long trenchcoat whirled as the the tall bounty hunter snapped to attention. Ceramic-clad highboots clanked together, pistol holsters moved and a long sniper rifle swayed on his back as he pulled off a mock salute under his broad-brimmed leather hat. “Goods. Delivery. As requested,” he growled in a soft, threatening manner which had made the bounty hunter the amorous attraction of girls across seven sectors, and the object of husbandly hatred across just as many. “Well, which one?” barked the stock-market shark impatiently. He had ordered a whole string of expensive heads served on a plate, and was not used to his underlings being so shy with words. It would take years to hunt down all his rivals, defectors and one-time business anchors in alien societies. So, which one of them was it that the bounty hunter had come to deliver? The tall whip of a man stood theatrically still for several moments, building tension and making his client's forehead throb with angry impatience. It had been several seconds already! Then, the bounty hunter opened his spacious trenchcoat and presented his goods hanging from hooks on the inside of the cardio-ferratic fake leather fabric. There were all seven of them.